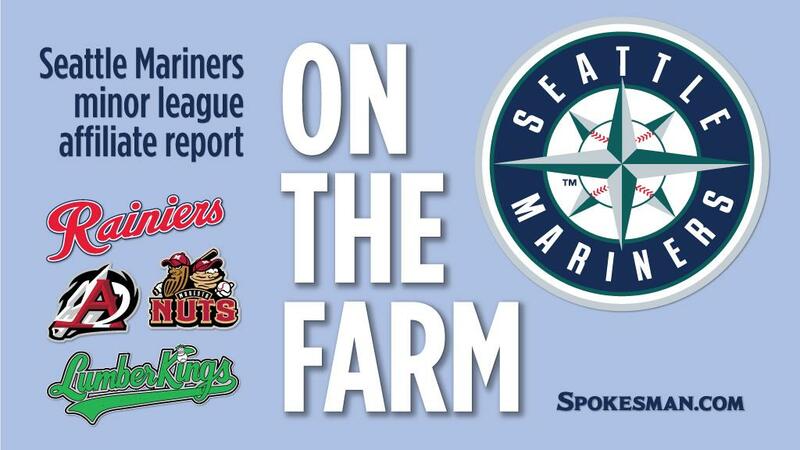 Mon., Aug. 28, 2017, 11:13 p.m.
Recaps for the Seattle Mariners top affiliates for Monday provided by team releases and wire reports. TACOMA, Wash. – Brooks Pounders got Leonys Martin to fly out with the bases loaded to end the game, leading the Salt Lake Bees (69-66) to a 3-2 win over the Tacoma Rainiers (65-70) on Monday. Salt Lake got on the board first in the third inning, scoring on a solo home run by David Fletcher. Trailing 3-1, the Rainiers cut into the deficit in the eighth inning when Ian Miller scored on a passed ball. Branden Pinder (1-0) picked up the win after he struck out one while allowing one hit over 1 2/3 scoreless innings. Cody Martin (0-2) went 4 2/3 innings, allowing two runs and three hits in the Pacific Coast League game. He also struck out six and walked one. SPRINGDALE, Ark. – Alfredo Escalera singled three times, and Josh Staumont allowed just two hits over six innings as the Northwest Arkansas Naturals (65-68) topped the Arkansas Travelers (60-73) 2-0 on Monday. Walker Sheller got Marcus Littlewood to fly out with a runner on first to end the game for his first save of the season. Staumont (3-3) struck out eight and walked one to get the win. Both runs for NW Arkansas came in the second inning when Humberto Arteaga hit a sacrifice fly and Anderson Miller scored on a ground out. Aaron West (0-4) went four innings, allowing two runs and six hits in the Texas League game. He also struck out three and walked one. The Travelers were held off the scoreboard for the 10th time this season, while the Naturals’ staff recorded their eighth shutout of the year. The Nuts were off on Monday. They start a three-game set with Lake Elsimore on Tuesday. CLINTON, Iowa – Ronnie Gideon doubled and singled, and Thomas Jankins pitched five scoreless innings as the Wisconsin Timber Rattlers (55-77) defeated the Clinton LumberKings (61-70) 6-1 on Monday. Jankins (9-9) allowed one hit while striking out three and walking one to get the win. Wisconsin got on the board first in the fourth inning, scoring on a solo home run by Dallas Carroll. After Wisconsin added two runs in the sixth on a single by Demi Orimoloye, the LumberKings cut into the deficit in the sixth inning when Johnny Slater hit an RBI single, scoring Billy Cooke. Steven Ridings (2-3) went five innings, allowing three runs and four hits in the Midwest League game. He also struck out three and walked three. Colton Cross pitched two scoreless innings for his second save of the season. EVERETT, Wash. – Eugene Helder hit a walk-off single with one out in the ninth inning, as the Everett AquaSox (34-37) defeated the Eugene Emeralds (36-35) 5-4 on Monday. Austin Grebeck scored the game-winning run after he reached base on a walk and advanced to second on a single by Chris Torres. After Eugene’s Jhonny Bethencourt hit an RBI single in the top of the seventh, Everett tied the game 4-4 in the eighth when Aaron Stroosma scored on a wild pitch. Reliever Scott Kuzminsky (1-0) picked up the win after he struck out one while allowing one hit over one scoreless inning. Luis Aquino (2-4) went 1 1/3 innings, allowing two runs and one hit in the Northwest League game. He also struck out two and walked two. Gustavo Polanco homered and singled for the Emeralds. Zach Davis doubled and singled twice, also stealing a base. Published: Aug. 28, 2017, 11:13 p.m.